Once you reach a certain year of age, it turns out that an eye cream becomes the most important cosmetic in our beauty bag. Mimic wrinkles are the first to appear on the delicate skin under the eyes. In order to enjoy a nice, taut and elastic skin without wrinkles under the eyes for longer – it’s advisable to use a top-quality eye cream. How would you define a good eye cream? 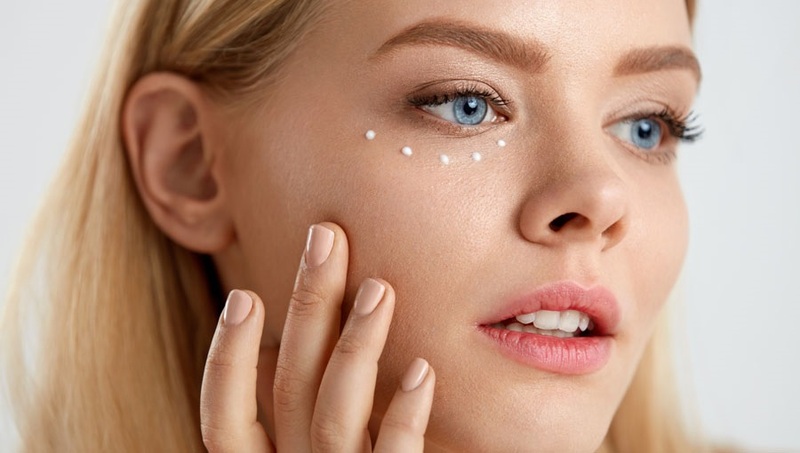 How do you find an eye cream that actually works? Under-eye skin – why does the eye area ages faster than the rest of the face? The skin under the eyes is extremely delicate: it has no occlusive protective layer (ie sebum), it is also thinner than other areas of the face. That is why it loses elasticity and tension quickly. It becomes flabby, irritated quicker and tends to loose moisturize. Therefore, it requires a special care focused on its needs. Before the age of 25, eye cream can be successfully substituted with the cream that we usually use for the face (it is important that it is moisturizing and does not contain, for example, alcohols or zinc – as in the case of acne skin creams). However, when the skin reaches a more mature age (more precisely, when it approaches 30), eye cream becomes a necessity. How to choose a good under-eye cream? First of all, you need to take a closer look at your skin – if you only notice the loss of laxity or the first delicate mimic wrinkles – choose a strictly anti-wrinkle cream, which contains a lot of active ingredients with moisturizing, rejuvenating and skin-tightening qualities. However, if in addition to such changes you also notice dark under-eye circles and puffiness skin (so-called bags under the eyes), or with tired, dull and greyish skin – choose a cream that contains ingredients that brighten the skin and eliminate swellings. What to look for in under-eye creams? It is good to know which ingredients are responsible for the rejuvenation of the skin and which are able to make fine wrinkles shallow or improve skin tone, or which ones will have a positive impact on the dark circles and swollen eyelids. Below, you will find a list of the best active ingredients to look for in the eye cream. Their presence in the cosmetic will indicate that you are holding a good cream in your hands. flavonoids – prevent the breakdown of collagen and elastin- ingredients that are building blocks and “scaffolding” for the skin. Under-eye cream – what ingredients to avoid? fragrance also referred to as parfum, added to the list of ingredients – we never really know what’s exactly hidden behind this name – it can be a natural fragrance, unfortunately, most often it’s only a drying alcohol. Under-eye cream – what do you recommend? This question is often found in online forums and in drugstores. It means one thing: an eye cream is a cosmetic which quality really matters. What is a good eye cream – there’s no direct answer to that issue. In fact, recently, many women have been recommending natural oils that provide rejuvenating effects as a substitute to regular eye area creams. These include raspberry seed oil, argan oil, and shea butter. Perhaps, it’s worth trying all-natural skincare products instead of ordinary face and under-eye creams? Next » Everything you need to know about detoxifying cosmetics « Previous Are cosmetics with mineral oils really hazardous to health?